Hello and welcome to the History Hour podcast from the BBC World Service with me Max Pierson. Next, we move forward in time and onto the streets of Liverpool, in the English Northwest. In the 1980s the industrial and economic changes introduced by Prime Minister Margaret Thatcher had led to considerable social change and tension. In the Summer of 1981 those tensions boiled over. During the riots that followed police used CS gas to control civil unrest for the first time on the British mainland. Claire Bose has been speaking to a man who took part in that rioting. Liverpool 8 or Toxteth as it came to be known in the media, a rundown part of Liverpool with a mixed-race community, poor housing and few jobs. In July 1981 it turned into a battlefield. The Grove street area along Parliament street, there actually police in a rank there with their riot shields. The older residents of the area didn’t understand why. Did you believe it would happen? No, no, no. I would understand if they had some kind of row with the police. But the younger people knew, Jimi Jaqne was 17 when the riots broke out and he and his friends were afraid of the police. When he was just 12 and a keen student he’d been stopped by police on his way from school. And he asked me in a kind of gruff voice you know “where was I going?” I explained to him that I was just coming home from school and I was on my way. So anyway, he got out of the car and he walked towards me, and as he’s walking towards me he accused me of being a liar. He opened my bag, went through it and he told me that I had to come to the police station. But instead he drove Jimi to some wasteland and racially abused him. He kept pointing out that kids like me needed to be removed from the street before we got old enough to break the law. And then he kicked me so that I fell over, and I fell over into a pool of water and then he picked up the bag and emptied the contents into the same pool of water. He got into the car laughing and then the two of them just drove off. Police at the time had the power to stop and search anyone they thought looked suspicious. In early July 1981, a young black man was arrested. There was a skirmish and three policemen were injured. 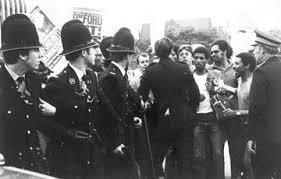 The next day the atmosphere in Toxteth was charged, and there was a big police presence. By early evening a full-scale battle had begun. There were lines of police with shields, and there were all these guys, there must have been about a 150 to 200 guys just, just, just, just throwing bricks from one side, and, and charging with scaffolding, trying to penetrate the line of shields. There were vehicles burning everywhere, there were people going backwards and forwards. There were members of the press, there were community leaders who I recognised, there was a couple of priests. And these flames licking high from these burning vehicles, and people literally trying to kill each other. I mean there were no holds barred and I thought what the hell is going on? I thought, nah I can’t do this you know, because in my mind I’m not a violent kid you know I read books. But then he spoke to a friend and asked him why he was joining in. I didn’t relate to the solution but I understood the sentiment because we feared every day. And I went to bed and I, I slept on this, I ended up at some point convinced, I can’t not be with my friends going through this. Britain was a completely different place back then to what it is now, we had no one listening to us. It was up to us to take control of our fate, we had to do something. I was out on Sunday afternoon, and the two guys who’d been out the night before they were geeing us up and saying “don’t worry, don’t be nervous, everyone looks out for everyone and and don’t be scared”. We went out and I remember I was really frightened I felt I was inviting all hells trouble. Once I’d thrown my first few bricks, it all seemed to be natural. You were amongst a lot of people who were all doing the same thing. At the same time the police, you were up really close to them and they were full of abuse, it was us against them and may the strongest survive. And when the first petrol bombs started being thrown, that really sorted out the men from the boys so to speak. It was really horrible to see men on fire, and it was really difficult seeing people in that sort of trouble. And potentially the possibility of really, really hurting someone, possibly to the point of death. Its true, there were times when I had to think about that, you know I was, I was involved in everything, I, I, the only thing I didn’t do was manufacture or throw Molotov cocktails. There were times when I was daredevil enough to go up to the front line with a piece of scaffolding and start smashing on a shield and if it got through the shield and it hit someone in the same way, where it would hit them it was no consequence to me, it was of no concern to me, I’d blinkered myself to it. I got involved. It wasn’t until first light this morning that the full extent of the damage became known. Along upper Parliament street where some of the worst rioting occurred it looked like the morning after a Second World War Blitz. Houses still smouldering, shops, offices burnt out. The next night as the riots intensified the police decided to use CS gas, Tear gas, for the first time on the British mainland. It was around 2 o’clock in the morning, they fired the first CS cannister. It landed on the corner of Catherine street, a lot of smoke started to pour from it and it caught me, and I had to run off to a house around the corner where I knew the family and I washed my face out, my eyes. It only the next day seeing the news that I realised the significance of it all. The Chief Constable of the local police force Kenneth Oxford explained why he’d taken this drastic step. It was a situation where I’d almost reached a point of overrunning or no return, call it what you will. I mean, these people had to be stopped and it was a last-ditch measure. There was one more night of rioting before it ended. Soon afterwards the Prime Minister Margaret Thatcher visited the area and spoke with some of the rioters to try to understand what had happened. It seemed like change might be on the way. The noises that the community leaders were making, they were trying to make it clear to anybody who’d listen that you know that this was a police relations matter. It had nothing to do with unemployment really, it had nothing to do with bad housing or poor education really. Those things had been going on since God’s creation but you didn’t have riots every day. And so, we felt as though this might pay off you know, that things might change. But the problem then was that over the next three weeks eventually police became more confident about coming back onto the streets. At the end of July riots broke out again, this time the police were more prepared, they began to break up the crowds using police vehicles. When a man was run over and killed the riots ended. Over 450 policemen were injured and 500 people arrested. It was for the most part a really frightening experience, it involved acts of behaviour on both sides the likes of which I had never seen before or been a part of before. But I felt as though, like most of us felt that there was so much at stake it was unavoidable. There was an inquiry into this and other riots that broke out across the UK that year, the report criticised the police and government and called for more community policing. Jimi Jaqne graduated from university and is now a community activist and teaching assistant, he still lives in Toxteth. Claire Bose. Well that type of rioting which took place on the streets of Liverpool in 1981 is pretty rare in Britain, but there are certain themes which crop up from time to time and result in similar tensions. They revolve around poverty, housing, policing and occasionally summer heat. I’m joined now by Professor Richard Phillips of Sheffield University whose carried out research into the Toxteth riots. Just for a sense of the general context of what happened, the relationship between the public and the police, we heard of Jimi Jaqne’s appalling experience being roughed up by a police officer, how common was that? Much more common than you’d like to think, I mean the older person speaking in that interview was surprised by it, and I would have been surprised by it myself from where I was in this country. But me and my colleagues in Liverpool spoke to a number of people who’d been involved in those disturbances. They also spoke of being battered by the police, of being taken down to the police station and held without charge. So how would you assess the blend of causes if you like, were these anti-police riots or was there also the poverty, the deprivation, the housing that fed into them? The easy answer to that is that it was poverty and it was housing and that was the answer that was most graspable by the government so what Mrs Thatcher did at the time was to appoint Michael Heseltine the Environment Secretary to go to Liverpool and to investigate and to visit places, she went herself as was mentioned in that report as well. But if you talk to people who were directly involved in the disturbances those things were very much secondary. The thing that really upset people that really provoked people to riot was the way that they and their friends had been treated by the police. The Liverpool born Black community had been in the city for four generations. They’ve been there since the 1880s in one form or another, a mixed-race community. So, they’re very, very much Liverpool very much British, the only difference between this community and other people was there race. What was the result of the Heseltine inquiry into what happened and the attitude towards inner-city areas similar to Toxteth in other parts of Britain? Heseltine was focused on Merseyside, he came up with all sorts of plans for environmental improvements, for detoxification, for investment. He launched the Merseyside Development Corporation which came up with economic solutions, but the real inquiry into these issues wasn’t really conducted by Michael Heseltine it was conducted by Lord Scarman. Scarman really focused on race, he acknowledged that white people were involved as well but he said that there was a lot of angry young men, and most them he said were black. And he acknowledged that there was discrimination in policing, he acknowledged there was disadvantage in black communities. He didn’t accept the charge that there was institutional racism, that was a charge that wasn’t accepted in relation to the police until 1999. But Lord Scarman went quite a long way and he came up with a lot of recommendations including employing more black minority ethnic community members in the police, monitoring racial abuse, the sorts of things we heard about from Jimi. Scarman wrote that report and came back to look at whether that had made any difference a couple of years later, he wrote a postscript to it and he concluded that in some ways it had. So, what’s Toxteth like now, compared with 35 years ago? There’s a lot less unemployment than there was then. The City has had something of an economic revival. But one thing that you’ll notice if you go to Liverpool 8 is that there’s quite a lot still of dereliction. There’s a lot of houses, streets which are being demolished or waiting to be demolished. Professor Richard Phillips from Sheffield University, and his book on the subject co-written with Diane Frost is entitled Liverpool 81. We had no one listening to us. It was up to us to take control of our fate, we had to do something. The lad whose arrest kicked it all off is a face in the area now and he visited one of our stalls a few years back. We had a good conversation about the police and prisons. Good lad. I once did some labouring in Liverpool. A white scouse old timer recalled that the episode was 'like zulu but in reverse'. Reddebrek, to embed videos from youtube you need to click 'share' under the video on youtube, then click 'embed' and then copy that code into the main body of the article on libcom. Then, before you submit, click where it says 'input format' just under the section on libcom you've just copied the code into and select 'Full HTML'. Then it should be visible to everyone (I've done it above if you want to have a look).